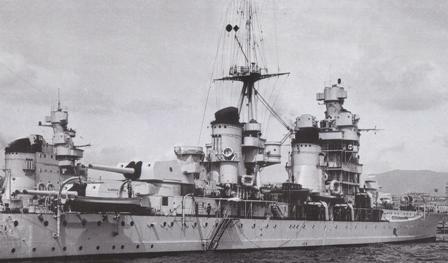 In June 1940 the Regia Marina, as it did with its battleships, entered the war with a fleet of relatevely new cruisers. There were still the old San Giorgio, Bari and Taranto (ex Pillau , and ex Strassburg received from the Germans after WW I), but all other units were of the kinds contemplated by the Treaty of Washington. The heavy cruisers had a displacement of 10,000 tons and were armed with guns up to 203 mm (8in); light cruisers had a displacement ranging from 5000 to 9000 tons and guns up to 152 mm (6in). Initially, the Regia Marina followed the trends set by other navies, especially the French one, building the 10,000 tons Trento and Trieste placing more emphasis on speed to the decrement of armor. The Italian heavy cruisers were built in only two classes: 3 units of the Trento class with 4 propellers and 150,000 HP, and 4 units of the Zara Class with only two propellers and 95,000 HP, but a much heavier armor, almost twice as thick as the one on the Trentos. It is to be noted that the Bolzano, even though like the Trento class had 4 propellers and 150,000 HP, was a much improved version of this class and it took advantage of the operational experience acquired between 1925 and 1930. Both heavy and light cruisers were equipped with torpedoes at exemption of the Zara class. The Trento class had 4 double launchers in fixed installations. The catapults for airplanes on the Trento, Zara were fixed and place on the most forward part of the bow, while the Bolzano had a single catapult installed between the two funnels.